Today I’ll keep it short and sweet. 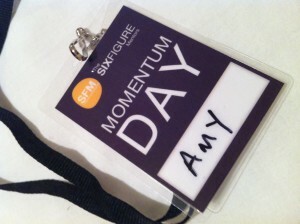 I have just come home from my first Momentum Day since joining the Six Figure Mentors and Digital Experts Academy. I could not have wished to have spent one of my few Saturdays off with a more giving, interesting, like-minded and motivated group of individuals. I have no doubt I have also just made a few genuine new friends. It’s a pretty self-explanatory title for an event. Just as overwhelm of learning this new world of online business was setting in again and I was giving myself grief for not posting a blog for a couple of days, I spent the day in the company of fifty or so other members of a community of ambition, drive, motivation and success – personified. One half of the founding partnership, Jay Kubassek, delivered a no-holds barred reality check on life and what it takes to achieve your goals for close to 9hours. All this despite not having slept a wink during the last 36! What a nice guy. No hype. No fuss. No ego. Just a decent human being who wants to pass on anything he can to enable others to succeed. 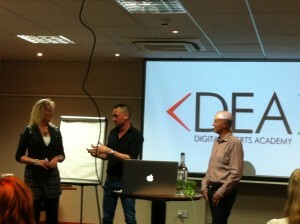 Greg & Fiona Scott then shared their story since joining the top tier of the Digital Experts Academy. Equally as decent, ego-free, inspiring human beings. There was also no sign of any precious attitude from anyone thinking that by sharing and offering help or advice may mean you’re then a threat to their own success. A refreshing change from what I’ve experienced many times in my various workplaces! I have never felt more confident of having made a positive decision than I do after embarking on this new venture with this particular team of people and their ever-growing community. It’s going to take time, blood, sweat and likely tears to see it change my life and offer me the freedom I’m in pursuit of. But I have no doubt I have all the tools and support I’ll need at my disposal to get there. As someone in the SFM in Australia, I thank you for posting this blog. It proves again what I have learned about Stuart and Jay from the various webinars I have sat in on. I am so grateful to be a part of this and hugely motivated to succeed every time I see or read a piece about these guys and when I share time with the Downunder Marketing mob. Thanks for reading, Eileen. Pretty sure I heard a rumour of Momentum Days in the pipeline for you guys down under – I’ve heard nothing but good things about you all! It was a great day so you’re in for a treat. Take care and good luck! Great words Amy and I agree completely – what an amazing bunch of people and was good to meet you and everyone else I managed to chat with. I now have a head full of new ideas !